If your idea of a dreamy escape involves golfing, fruit orchards and endless wine tastings, our Yakima hotel is close to it all. Enjoy the laid back atmosphere that only Yakima Valley Wine Country can provide. At our hotel, guests truly get away from it all but still enjoy all the modern conveniences. Right off I-82, it's easy to get to our property, whether you're here for sporting events, tournaments or to visit the vineyards. Close to tasting rooms, you're sure to pick up a new favorite bottle when exploring the region. Enjoy a full hot breakfast each morning when staying at our hotel. Our breakfast buffet features hot waffles, sausage and eggs, biscuits and gravy, sweet pastries and fruits, a selection of cereal and yogurt, plus 100% Arabica coffee. Before heading out for an event at the Sun Dome or the Fairgrounds, a hearty American breakfast is just what guests need to kick off a great day. No matter what adventure is ahead, our friendly staff makes sure each morning starts wonderfully. Our hotel is also a favorite for many business travelers, including those with the Department of Ecology. General Electric, Siemens, Kroger, and the Department of Wildlife also regularly bring guests to our property. A 24-hour pool and hot tub, luxurious bedding, quiet rooms and plenty of space make for an idyllic home away from home when you're here for a longer stay. Whether it's a weekend getaway or an extended stay, we always go the extra mile to make you as comfortable as possible. Is there anymore we can do to make your stay at our hotel better? Just ask, and we'll always do everything possible to make it happen. We're committed to your full satisfaction during your entire stay. 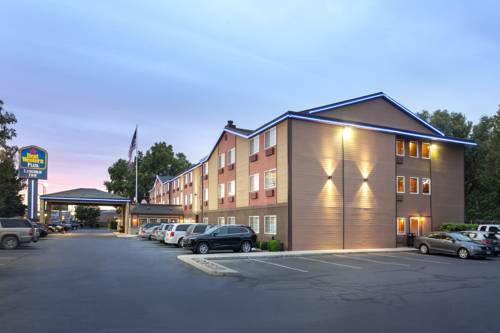 Book a spacious room at the Best Western Plus Yakima Hotel today and enjoy a relaxing vacation! From: Highway 82 East. Take Exit 31B, head south on North First Street. The Best Western Plus Yakima Hotel is on the right hand side of the street. From: Interstate 90. Take Interstate 82 East to Yakima then take Exit 31B. Head south on North First Street, the Best Western Plus Yakima Hotel is located three blocks down on the right side. From: Highway 12. Take the North First Street Exit. Head south on North First Street, the Best Western Plus Yakima Hotel is located three blocks down on the right side. Capitol Theater,2 mile(s) from Capitol Theater, Various entertainment shows, concerts and symphony performances. Greenway Park,1 mile(s) from Greenway Park, Excellent walking and running trails along the Yakima river. Sun Dome,4 mile(s) from Sun Dome, Several events are held here annually such as sports tournaments, tradeshows, concerts and more.